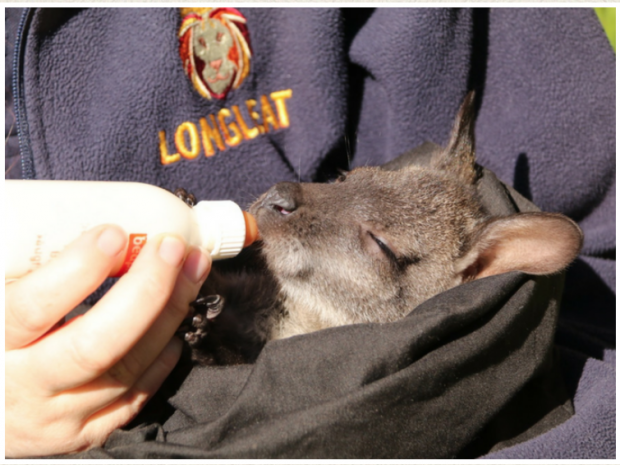 A baby wallaby is being hand reared in a rucksack after being abandoned by his mother. The red-necked wallaby, nicknamed Newt, was rescued after being let out of his mother's pouch during snowy weather at Longleat in Wiltshire. Keepers Gemma Short and Jodie Cobb have adopted the baby, thought to be 30 weeks old, and carry him round in a substitute pouch made from a rucksack. Gemma and Jodie will have to keep up their role as adopted parents for up to 18 months until the youngster is fully weaned and ready to return to the wallaby colony. At birth he weighed just 20 grams and was little larger than a baked bean.